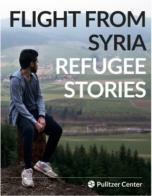 What I’d like to share with you this afternoon is one of the Pulitzer Center's new media projects—an e-book called "Flight from Syria: Refugee Stories"—a look behind the scenes at the lives of refugees. "Flight from Syria" brings together unique perspectives from nine of our journalists, all Pulitzer Center grantees. We started planning our e-book a year ago at a time when the world paid scant attention to Syrian refugees. As you may remember, it was not until this past August that news coverage took a dramatic turn. The image of Aylan Kurdi, the three-year-old boy, carried out of the sea by his father, was on the front page of every major paper, as well as on the evening news. Other stories of pain and suffering followed reminding us time and again that well more than 4 million Syrians have fled—one of the largest displacements of modern times. More than 15 million Syrians have been affected—they are cold, hungry or starving, sick, some gravely ill, many now jobless. Young girls and their parents may be facing a difficult choice—opting for early marriage to ensure survival. Other children collect garbage to earn a few pennies. Archaeological sites, including the 2000-year old temple at Palmyra—have been looted or destroyed—the antiquities scholar at Palmyra beheaded. Refugees continue to be exploited: This past weekend we learned that 2,500 life jackets to be used by refugees were seized by Turkish police. They were deemed unsafe. In recent months, we have also been touched by stories of kindness and generosity—the Icelandic author, Bryndis Bjorgvinsdottir, started a Facebook group to call for her country to take in 5,000 refugees, well more than the 50 the country had agreed to help. 13,000 were quick to join the Facebook group, many offering to pay for flights and host refugees. Our e-book, Flight from Syria, delves into the history of the current situation, the underlying policies, and the human face of war. It draws on reporting our grantees did for a range of news outlets since 2012—from The New York Times and NPR to the New York Review of Books and the BBC. It can be viewed on an ipad, computer, or smartphone, is free, and includes photographs, informational graphics, and links back to each of the reporting projects. In Flight from Syria, our journalists went behind the scenes to examine the lives of refugees and provide a testament to their suffering and courage—glimpses into their hearts and minds. Hugh Eakin and Alisa Roth look at what has been lost—the collapse of one of the Arab world’s most diverse societies. They wonder: What happens when one brother turns against another? They show us life in a Turkish city, not far from the Syrian border, one now transformed to become a “little Aleppo.” Refugees struggle to re-create the life they left behind—through tradition, song, food, and yes, the coffee. Other journalists tell of Syrian Armenians whose ancestors had fled to Syria a hundred years ago—finding a safe haven from the Ottoman genocide. Or of the Palestinians who had come from Syria and now find themselves forced to leave—yet barred from entering other countries. Everywhere a closed door. In many countries ordinary citizens have answered the call. Joanna Kakissis takes us to Greece, Germany and Sweden where some refugees have found jobs and adequate healthcare. Family members who have been separated for months, or even years, are reunited. Stephen Franklin introduces us to three remarkable Syrians who only recently escaped: a former high school science teacher who now conducts make-shift classes for young refugees, a lawyer who assists other refugees without pay, a pediatrician who heals the wounds of injured fighters. Lauren Gelfond Feldinger reports from Jordan where Syrian volunteers are working with refugee children. They use art, photography, music, sports and team-building games to teach non-violent problem solving. During one session a child draws a picture of helicopter dropping bombs on a bleeding house. Flowers grow around it. When asked why she made the drawing she answers, “I saw my aunt’s house bombed…she’s dead.” The volunteer is shaken when he sees the drawing, but he knows the art serves as therapy—a way to heal. Refugees can leave their homeland behind, but it is more difficult to escape the consequences of the war—or erase psychological and emotional scars. Our journalists have found that grassroots organizations, such as the one Nousha Kabawat started, can provide much needed support—taking a holistic approach to heal both body and soul. It is because of them that children will grow up not only with dark memories, but with expectations, dreams and promises of a new life. And little by little the bird builds its nest.